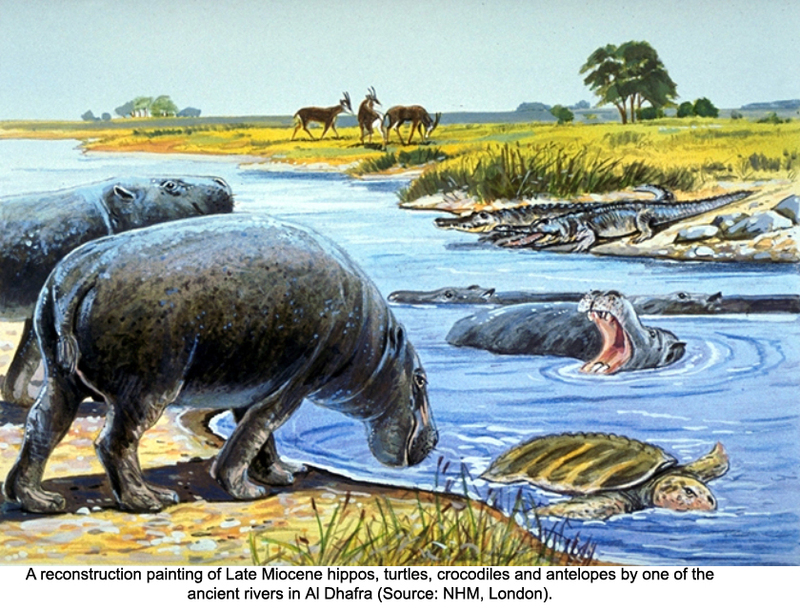 ABU DHABI, 16th May 2017 (WAM) -- Scientific studies of fossil bones of an extinct relative of the hippopotamus from the Al Dhafra Region of Abu Dhabi have identified a previously-unknown species, according to a paper recently published in the specialist journal, 'Palaeo Vertebrata'. 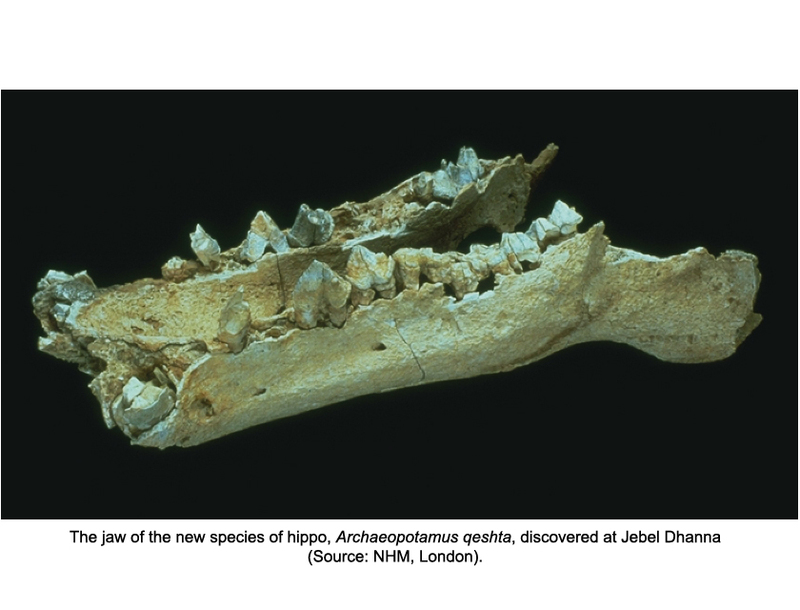 The species has been named Archaeopotamus qeshta, the first word meaning 'ancient river' and the second being taken from the Egyptian dialect word for hippopotamus, meaning 'cream'. Studies of new fossil specimens discovered since 2003 have enabled scientists to re-evaluate earlier material and to determine that all of the material from the UAE belongs to this newly-described species. Mohamed Khalifa Al Mubarak, Chairman of the Abu Dhabi Tourism and Culture Authority, said, "We have initiated five exploration projects for major archaeological and historical sites under TCA Abu Dhabi’s mandate to preserve and safeguard Abu Dhabi’s heritage and culture. Scientific research continues to reveal that the Al Dhafra region was once an area quite different from today's arid environment. These significant finds indicate that a very extensive river system flowed throughout the area with many kinds of animals sustained by this environment." Commenting on the new discovery, Dr. Mark Beech, one of the authors of the paper and Head of Coastal Archaeology and Palaeontology in the Historic Environment Department of Abu Dhabi Tourism and Culture Authority, TCA Abu Dhabi, said, "This is yet another important study adding to our knowledge of the ancient environment of Abu Dhabi and we still have much more to learn about this fascinating chapter in the history of the UAE. "TCA Abu Dhabi plans to continue its investigations of Al Dhafra's internationally important fossil sites. It is vital that such sites be protected for future scientific investigation," he added. In order to increase awareness of these sites, TCA Abu Dhabi recently co-published a book with the Peabody Museum of Natural History at Yale University. This book, entitled 'One Thousand and One Fossils - Discoveries in the Desert at Al Gharbia, United Arab Emirates' by Faysal Bibi, Andrew Hill and Mark Beech, was recently launched at the Abu Dhabi International Book Fair. The fossil bones come from the geological Baynunah Formation, which is exposed on the surface over much of the coastal areas of Al Dhafra, and were found in a number of locations, including Shuwaihat, Jebel Barakah, Jebel Dhanna, Ruwais, Gerain al-Aysh and Jebel Mimiyah, near Mirfa. They were collected between 1988 and 1995 by the late Peter Whybrow, from London's Natural History Museum, and the late Andrew Hill, from Yale University in the United States, and during surveys from 2003 onwards undertaken by Hill, Faysal Bibi, from the Museum fur Naturkunde in Berlin, Germany, and Mark Beech. The Baynunah Formation has been dated to between 6 and 8 million years ago, in the Late Miocene period. It has produced the only known fossils of animals from terrestrial and freshwater environments from this period anywhere in the Arabian peninsula. These include fossils of large and small animals, including early elephants, giraffes, horses, gazelles, fish and aquatic reptiles, like turtles and crocodiles, and plants. The environment of Al Dhafra at that time has been compared to the savannahs of present-day East Africa, with open plains and large rivers, fringed by woodland.